APPLIED PHYSICS LABORATORY, LAUREL, MD – A mysterious mountain in the middle of a moat on Pluto’s biggest moon Charon, has captivated and baffled scientists leading NASA’s New Horizons mission which made history when it became the first spacecraft to visit our solar system’s most distant planet barely two days ago on Tuesday morning, July 14, 2015. NASA released the first close-up image of Charon today (July 16), shown above, and it has the geology team scratching their heads in amazement and wonder. They can’t figure out the nature of a big mountain set inside a moat. The new image shows a depression with a mountain peak in the middle. The location of the “mountain in a moat” is shown in the inset of a global view of Charon. The new high resolution image of Charon was taken at approximately 6:30 a.m. EDT (10:30 UTC), barely an hour and a half before the piano-shaped spacecraft’s closest approach to Pluto on July 14, 2015, from a range of only 49,000 miles (79,000 kilometers). The image was captured by New Horizons’ high resolution Long Range Reconnaissance Imager (LORRI). A much sharper view is yet to come, because the image is heavily compressed. “Sharper versions are anticipated when the full-fidelity data from New Horizons’ Long Range Reconnaissance Imager (LORRI) are returned to Earth,” say NASA officials. Altogether it will take 16 months to transmit all the data collected by New Horizons at the Pluto system. The area in the LORRI image comprises an area approximately 240 miles (390 kilometers) from top to bottom. And a “swath of cliffs and troughs stretching about 600 miles (1,000 kilometers) suggests widespread fracturing of Charon’s crust, likely the result of internal geological processes,” notes the team. The Texas-sized moon measures about 750 miles (1200 kilometers) across, about half the diameter of Pluto. Pluto spans 1,471 miles (2,368 km) across. 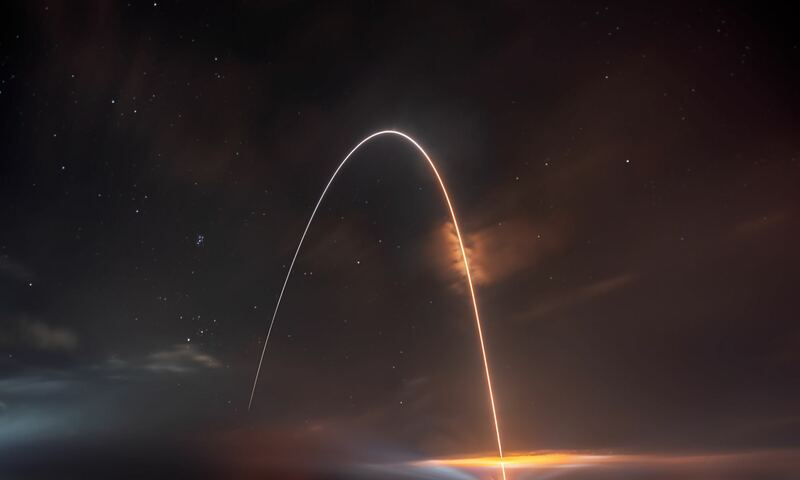 After a nine year voyage through interplanetary space, New Horizons barreled past the Pluto system on Tuesday, July 14 for a history making first ever flyby at over 31,000 mph (49,600 kph), and survived the passage by swooping barely 7,750 miles (12,500 kilometers) above the planet’s amazingly diverse surface at 7:49 a.m. EDT. It passed about 17,900 miles (28,800 kilometers) from Charon during closest approach. Watch for Ken’s continuing coverage of the Pluto flyby on July 14. He was onsite reporting live on the flyby and media briefing from the Johns Hopkins University Applied Physics Laboratory (APL). New images will be released on Friday, July 17 – watch for my story.